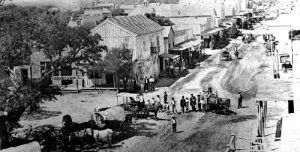 Among the early settlers of Lampasas County, Texas were the Horrell and Higgins families. First settling here from Georgia in 1848 was the Higgins family. Their son, John Calhoun Pinkney “Pink” Higgins was just a baby, who would grow up to become a hard-working rancher and one of the main “players” in the bloody feud that was to come. Sometime later, in 1857, the Horrell family from Arkansas would settle near the Higgins property. The families were friendly neighbors until the 1870s when tensions began to build between them. When the Horrell sons – Mart, Tom, Merritt, Ben, and Sam grew up, they were a rowdy bunch and in 1873 had their first run-in with the law. At this time, Lampasas, Texas was a wild frontier town and right in the middle of the fray were the Horrell brothers, who some called “fun-loving cowboys,” but others were getting fed up with, as they regularly “shot up the town” and were quick to find all sorts of trouble. In January 1873 when Lampasas County Sheriff, Shadrick T. Denson led a posse who attempted to arrest two brothers by the names of Wash and Mark Short, the sheriff was stopped by the Horrell brothers who shot him and turned around the posse. Shadrick would later die from the gunshot. With the lawlessness seemingly out of control in Lampasas, the county judge appealed to Texas Governor Edmund J. Davis for help. On February 10, 1873, Governor Davis issued a proclamation prohibiting the carrying of sidearms in Lampasas. The following month, seven members of the Texas State Police arrived to enforce the Governor’s proclamation. On March 19th, they arrested Bill Bowen, the Horrell’s brother-in-law, for carrying a firearm. They then made the mistake of entering Jerry Scott’s Saloon, with Bowen in tow. Inside the saloon were the Horrell brothers and their friends. Upon seeing the officers with their brother-in-law arrested, they immediately confronted the officers. In no time, shots began to blast through the saloon, leaving four of the officers dead, including Captain Thomas Williams. As would be expected, more state police, along with the Lampasas Sheriff, and the Burnet County Minute Men, were all searching for the lawless Horrell brothers. Mart Horrell and three other men were later arrested and taken to the Georgetown, Texas jail. However; on May 2, 1873, Mart’s brothers and some 30 other cowboys stormed the jail and freed Mart and his friends. The brothers remained in Texas for a couple of months, rounding up and selling their cattle. They then took off for New Mexico, where they landed in lawless Lincoln County, near the present-day village of Hondo on the Rio Ruidoso. Keeping up their rowdy ways, Ben Horrell, former Lincoln County Sheriff Jack Gylam, and a man named Dave Warner rode into Lincoln on December 1, 1873, and after carousing a number of saloons and brothels, the drunken men began to shoot off their guns. When Constable Juan Martinez demanded that they surrender their weapons they compliantly handed them over. However, they soon procured more weapons and were shooting up another brothel. When confronted again by Constable Martinez and four other officers, Dave Warner, who had a long-standing grudge against Martinez, pulled his pistol and shot and killed the constable. The lawmen returned the fire, killing Warner, but Ben Horrell and Jack Gylam fled. The lawmen aggressively pursued the pair and when they caught up with the two hell-raisers, they pumped their bullets into them, shooting Horrell nine times and Gylam 13 times. The remaining Horrells quickly retaliated, killing two prominent Hispanic citizens. Sheriff Alexander Hamilton Mills soon rounded up a posse to arrest them, but after a stand-off at the Horrell ranch, they retreated. On December 20th, the Horrells returned to Lincoln, where they stormed a Hispanic celebration and killed four men and wounded a woman. Efforts were again made to arrest the Horrells but the lawmen were unsuccessful. Warrants were issued for their arrest as more clashes occurred between the Horrells and Hispanic citizens. In early 1874, the brothers and some of their friends began to head back to Texas, continuing to harass Hispanics along the way. One Horrell associate, Edward “Little” Hart murdered Deputy Sheriff Joseph Haskins at Picacho, New Mexico because he was married to a Hispanic woman. About 15 miles west of Roswell, when the Texans encountered five Hispanic freighters, they killed every man. All in all, at least 13 Hispanic citizens were killed by the Horrells and their friends. Later, when they made their way back to Lampasas, they found themselves no longer perceived to be “fun-loving cowboys,” rather they were treated like pariahs, with some citizens taking potshots at them, though no one was killed. In 1876, the surviving Horrell brothers stood trial for the murder of Captain Thomas Williams, but they were acquitted. That same year, tensions between themselves and John Calhoun Pinkney “Pink” Higgins came to a head when Higgins began accusing the Horrell brothers of stealing his cattle. In May, Pink filed an official complaint accusing Merritt Horrell of taking one of his calves. Though the case went to trial, Merritt was found not guilty, and Higgins promised Horrell that he would settle the matter later with his gun. Pink’s threat was not an idle one. 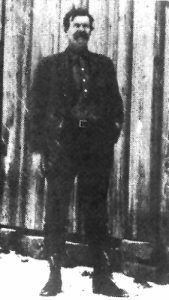 On January 22, 1877, Pink Higgins shot and killed Merritt Horrell in Wiley and Toland’s Gem Saloon in Lampasas. The three remaining Horrell brothers vowed revenge on Pink Higgins; his brother-in-law, Bob Mitchell; and his friend, Bill Wren. On March 26, as Tom and Mart Horrell were ambushed four miles east of Lampasas by the Higgins party. Though both brothers were injured, they were not killed. When a warrant for the arrests of Pink Higgins and Bob Mitchell was issued, the pair surrendered to Captain John Sparks of the Texas Rangers for their part in the murder of Merritt Horrell. After each posted a $10,000 bond, they were released. 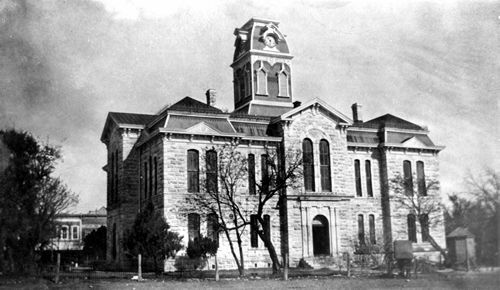 Interestingly; however, the Lampasas courthouse was burglarized on June 4th and district court records disappeared, among them the bonds of Higgins and Mitchell. A short time later, on June 14, 1877, Pink Higgins, along with Bob Mitchell, Bill Wren, and Pink’s brother-in-law, Ben Terry, rode into Lampasas. Already there, were the Horrell brothers and some of their friends, gathered in the square. Though it is unknown who fired the first shot, an all-out gun battle began to take place right in the middle of town. Before the citizens would persuade the clans to stop firing, Bill Wren was wounded, and Frank Mitchell, Bob’s brother and cousin of Pink Higgins’s wife, was killed. 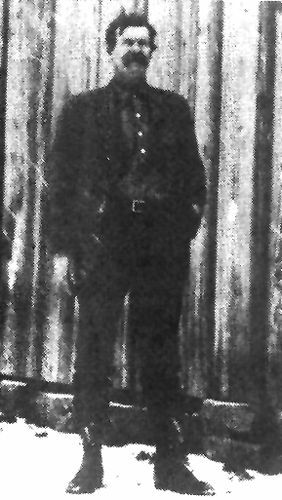 Buck Waldrup, a newcomer to the Horrell Gang, as well as a man named Carson Graham, were also dead. When the smoke cleared, both factions left town. The Texas Rangers had to be called in to keep the clans from continuing the “war.” A detachment of Rangers soon surprised the Horrells in their beds and persuaded them to submit to arrest. Major John B. Jones then negotiated with the two sides to agree to stop the fighting. Early in August, each side of the faction signed documents to let the feud be over. Though officially over, the following year, Tom and Mart Horrell were suspects in a robbery/murder of a country storekeeper in the southwestern part of Bosque County. While confined in the Meridian, Texas jail, it was stormed by a vigilante mob and the two were shot to death. Though this might have simply been the work of vigilante justice, many believed the Higgins faction had manipulated the event. The only remaining brother, Sam Horrell, moved his family to Oregon in 1882. He died in California in 1936. 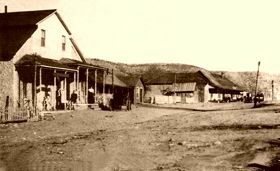 Pink moved his family to the Spur area in the 1890s, where he worked as a range detective for the Spur Ranch. He died of a heart attack at his home in 1914. © Kathy Weiser/Legends of America, updated April 2018.